Please join us this Easter Sunday, April 16, to celebrate the resurrection of our Savior. Easter morning breakfast will be served in Gallihugh Hall from 7:30 until 9:30 AM. Thank you, Methodist Men! Traditional Decorating of the Cross. Sterling UMC has been in existence for 140+ years with generations of families still attending here. 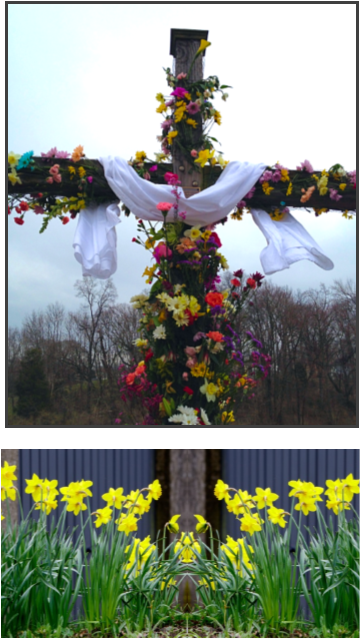 One of the Easter traditions through the years, precious to many, is to bring spring flowers to decorate the “old rugged cross” that stands on the hill in front of our church, then take a family photo in front of that iconic symbol of Christ’s overcoming resurrection. This reminds us of God’s power on our behalf, His faithfulness through another year, and how, as we put our faith in Christ, everything is made new. Feel free to make this part of your Easter tradition here at Sterling UMC!